Another crucial ongoing railway recruitment is for RPF SI and Constable. It is open for 9739 vacancies and the Computer Based Test (CBT) for it is beginning from December 19, 2018. Recently, Railway Protection Force (RPF) released the complete exam schedule for RPF SI 2018. The exam date has been released on the official website, si1.rpfonlinereg.org, on the evening of November 21, 2018. What is the RPF Constable CBT Schedule? – For now, the schedule of RPF Constable has not been uploaded on the official website, constable.rpfonlinereg.org. There is a possibility that it will be the same Sub Inspector but there is confirmation about it. 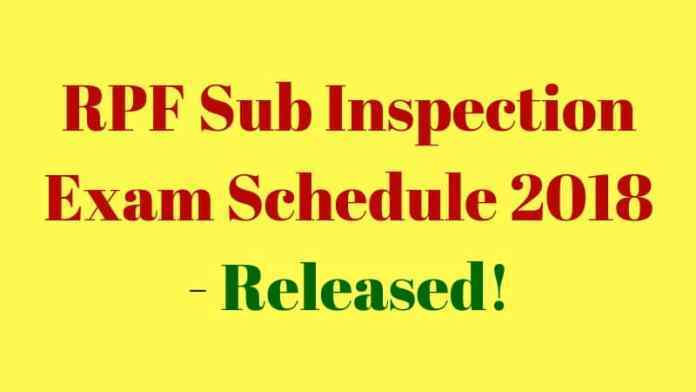 Indian Railway will announce complete RPF Recruitment 2018exam schedule and then we will know complete schedule of the exam. WHEN IS RPF SI AND CONSTABLE ADMIT CARD RELEASING? The admit card for RPF 2018 will be available 10 days before the examination. Hence, for the December 19 examination, the admit card will release on December 09, 2018, and so on. The candidates will be able to download the RPF admit card online, from the official website. Application number and date of birth will be needed to access the login. After downloading the admit card, the candidates will have to print it on an A4 sheet. On the exam day, along with the admit card, the candidates will also have to carry one photo id proof and one passport size photograph. The computer based test will be of held in 15 languages, which are Hindi, English, Urdu, Tamil, Telugu, Konkani, Malayalam, Kannada, Marathi, Gujurati, Bengali, Odia, Assamese, Manipuri and Punjabi. The duration of the exam will be 90 minutes and in it, candidates will have to solve 120 multiple choice questions. The question will be asked from General Awareness, Arithmetic, and General Intelligence & reasoning. From the 1st subject, 50 questions will be asked, whereas, from the remaining two subjects only 30 questions each will be asked. The question will be of 1 marks and for each incorrect answer, negative marking of 1/3 marks will be done.